If you’re operating a business in California, compliance isn’t something that can be taken lightly. This was a costly lesson Victoria’s Secret learned when they agreed to pay out $12 million to settle claims that they had underpaid employees that were working on-call shifts. 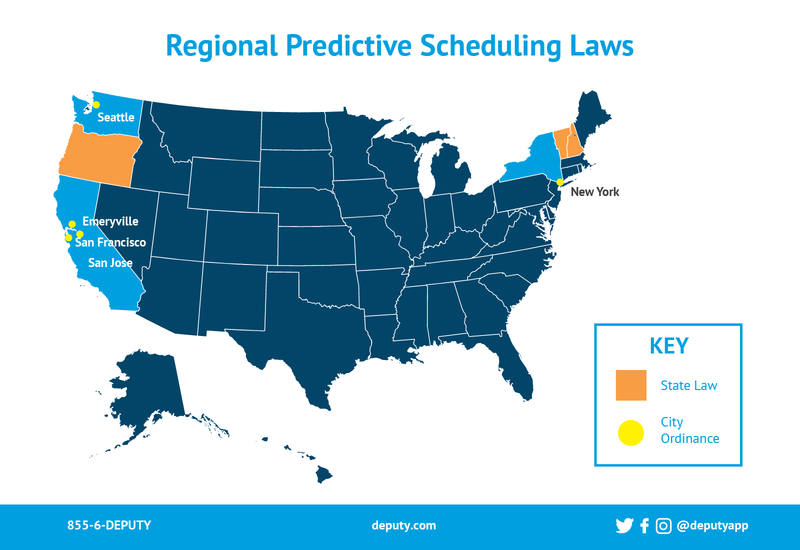 While California does provide some labor protections for employees that work on-call shifts, it has yet to adopt a state-wide predictive scheduling law. That hasn’t stopped three major cities in the Golden State from enacting their own municipal ordinances with similar mandates. San Francisco’s “Formula Retail Employee Rights” became the first municipal ordinance to regulate scheduling in 2014. The San Francisco law applies to retail establishments that operate in at least 40 locations worldwide and employ 20 or more people in San Francisco. Employers should first figure out whether they fall under the category of a retail establishment. The law is written so that it applies to as many businesses as possible and employers are considered operating a retail establishment if they have at least two of the following characteristics: a trademark, uniform apparel, standardized signage, standardized interior decor, or a standardized array of merchandise. In this sense, it even applies to many fast food restaurants. Work Estimates And Advanced Notice: New employees must be given an initial estimate of the number of hours they can expect to work and the estimate should include the potential days and range of hours that they could be working on. This estimate should be given when the employee is hired or when any considerable change occurs. Additionally, employers must provide notice of work schedules two weeks in advance of the next shift. Compensation For Changes: Employers must pay employees if a change is made to their schedules after it is posted. If the change is made less than 7 days (but more than 24 hours) before the shift begins, employers must provide employees with an additional hour worth of pay. If less than 24 hours notice is given to an employee, then employers must pay them 2 hours worth of pay if they are working a shift that is less than 4 hours long or 4 hours of pay if the shift is longer than 4 hours. On-Call Shifts: If an employee is scheduled for an on-call shift but not ordered to come into work, the employer must pay them 2 hours worth of wages for every shift of 4 hours or less that they were on standby for, and 4 hours worth of wages for every shift longer than 4 hours. Record Keeping: Employers are obligated to maintain schedule and payroll records for at least three years and provide these records to San Francisco’s Office of Labor Standards Enforcement upon request. As of July 1, 2017, Emeryville’s predictive scheduling law has been regulating the relationship between employee and employer. The legislation, which is called the Fair Workweek Ordinance, just ended its soft roll-out period, and businesses will now being to receive fines for violations. In a sense, the law greatly resembles the San Francisco ordinance. Emeryville retail and food service businesses that employ at least 56 people worldwide are covered under the law. Companies that have a collective bargaining agreement with a union are, however, exempt. Work Estimates And Advanced Notice: New employees must be given an initial good faith estimate of the number of hours they can expect to work. This estimate should be given when the employee is hired. Additionally, employers must provide notice of work schedules two weeks in advance of the first shift on that schedule. Hiring Practices: Before hiring new employees, employers must prioritize making part-time employees full-time. Record Keeping: Employers must retain records for 3 years. Compensation: If an employer makes changes to a schedule after the 14 day advance notice period but with more than 24 hours notice, they’ll only have to pay the impacted employee 1 hour worth of wages. If the change is made in less than 24 hours from when that employee is supposed to report in, employers will have to pay him or her for 4 hours worth of labor. Fines: A $500 fine is assessed for any violation of the city laws. These violations include a failure to: update work schedules in advance, provide additional pay for schedule changes, offer work to existing employees before hiring new staff, or maintain records for 3 years. The San Jose restrictive scheduling ordinance, Opportunity To Work, is a lot thinner than the previously mentioned legislation. It passed via voter initiative during the November 2016 election and went into effect on March 13, 2017. The ordinance requires businesses to offer additional hours to part-time workers before hiring anyone full-time. Business owners that continue to manually track and input schedules on the same old spreadsheet aren’t just relying on their ability to understand these compliance regulations, they’re gambling on the chance that they will never make a mistake. All it takes is a few unexpected sick days and an over-scheduling crisis to set you back potentially thousands of dollars in fines. That’s why it is imperative that employers find the right technology partner with the tools they need to streamline their compliance. With these sorts of rules, it’s important for employers and employees to be able to communicate in real time, and cloud-based technology is the most efficient way to do so. With the right platform, employers should be able to offer extra shifts to the appropriate employees and employees that foresee a scheduling conflict should be able to alert their employer well in advance. All records related to these regulations must be held for no less than three years and be available for any compliance investigations. With this in mind, you’ll also want tools that enable you to produce custom reports that meet the demands of any situation. With all of these requirements, predictive scheduling laws can sound like a headache. Thankfully, the most advanced, intuitive, and cost-effective program on the market has all of the features you’ll need in one suite. The post Maintaining compliance in California’s predictive scheduling regions appeared first on Deputy.